Over the years, I have discussed and analysed this, that and the other photograph of the Loch Ness Monster taken by a variety of individuals over 83 years. Looking back on these, I realised I have not actually ever handled a glossy photograph of the Loch Ness Monster. To begin with, it was prints in Nessie books and later in life the now ubiquitous digital images we all view on our computer screens or occasionally print off. So, whenever I call an article, "Analysis of the X Photograph", this is not strictly true. I am invariably examining a JPEG image or a glossy print from a book. This actually matters, as I shall explain later. Finally, I did get my hands on an original photograph, and that was the Peter O'Connor one taken in 1960. I purchased it last year and you can see it below propped up against a laptop screen displaying the same image, which was originally scanned from Tim Dinsdale's "Loch Ness Monster". On the reverse side of the photograph are the words below. 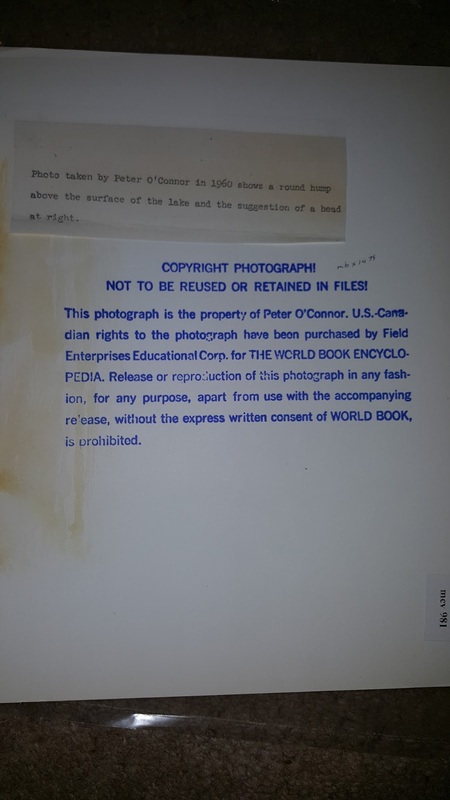 The North American rights to the image had been purchased by Field Enterprises Educational Corp. from Peter O'Connor for the use of their subsidiary, the World Book Encyclopedia. I note the back says the photograph is the property of Peter O'Connor. I am not sure how that works out. Do they mean he retained the intellectual property rights or did he continue to own the glossy print? I would presume the first option. World Book Encyclopedia's involvement with the hunt for Nessie is already well known to researchers and historians. As you can see from the image below they sponsored Dan Taylor's submarine expedition as well as other Loch Ness work. 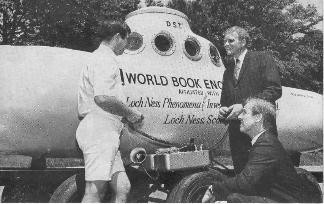 Thanks to the work of Dr. Roy Mackal (also photographed above, standing to the right), the Loch Ness Investigation Bureau secured a $20,000 grant towards upgrading equipment in 1967. That would be about $150,000 in today's money. So, it may be that World Book Encyclopedia acquired the O'Connor photograph around the same time. The clipping below mentions the grant and is taken from the Boca Raton News dated 18th June 1967. So much for the origin of this glossy photo, but what use is it? I did notice when comparing it to the screen image, that the digital image was more cropped. I would say the digital image had been cropped by 10% along the vertical, with more taken off the top than the bottom. This did not actually reveal much more on the glossy, just more blackness. though I am looking more intently into some markings. However, that is not the main problem, and this goes to the heart of many a Nessie photo. The glossy photo I got in the post is also a cropped picture! This is known because Tim Dinsdale's book also published another aspect of the O'Connor picture showing more in the horizontal plane (reproduced below). In other words, I have a photograph of the O'Connor creature, but not the real, uncropped photograph! That is a disappointment and you can extend that problem to other Nessie pictures which are normally offered to us in a zoomed-in format. In other words, the search for these better images continues. Been off with a bad cold, back to normal. 1 oz of 80- 100 proof whiskey in 4 oz water,simmer but bring to steam.turn off,throw towel over head,put head in sauce pan inhale deeply,several times. Use all night if needed,but warm up. This can stop the worst pneumonia,and was used vy doctors in the past. Plus you get a nice buzz. Its called alcohol inhalation and is very efdective at killing serious lung infections. I.can think of no better place than scotland to test this therapy! Since you did not address what is in the photo as much as cropping of the photo, I'll not go into the fact that the subject is in no way moving or swimming - oh wait, I just did. Sorry. Staying on topic then; based on the hop spot of the flash I'd say that the Dinsdale is cropped as well. Did you purchase the glossy based on the idea that it was the original? Not moving? I should address that, but not here. Yes, I knew it was cropped and had addressed that before in one of my POC articles. Its moving.look at the head area..theres a wake. Depends on the animal's speed.at slow speed the wake appears appropiate. Download the photo and blow it up, its very interesting. I'm wondering does the original you have show any more detail than what you've seen up to this point? It certainly looks a little cropped on that side, but, and I'm not an expert in film photography, I imagine it still could have been printed from the negative. Maybe it was a bit of sloppy centering, or maybe the image was slightly 'zoomed in' when transferring from the negative. Since I have no background in this, these are just my theories. 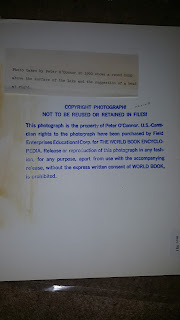 Mr O'Connor probably sold the photographic rights to New World Encyclopedias whilst retaining the physical copy. Commercial photographers generally retain the copyright of their image, even when having them printed for customers, unless it is for advertising purposes, when copyrights are then sold. It always annoyed me how these old images were cropped, copied from who knows where, whilst the details were lost and the darks when black. Sadly, you really need the negative to copy from, but at least digital has made this easier for us. Still not without its pitfalls though. Indeed, what we have may only be part of the original negative. They always love to zoom in on the monster. It's one of the more interesting snaps, instead of the usual tiny dark blob 1/2 mile away you can't deny O'connor has got a very detailed image of a large floaty thing in a body of water. What it is and where it was taken is up for debate. We await GB's further missives with interest. This is how I imagine more photographs of nessie to be, they all can't be from a half mile away. If this is the loch ness monster and not a hoax then Peter O'Connor has got more bravery than most! How did he know nessie was there in the dark of night? The camera flash would be the only light source, did he wade into the Loch in pitch black night???? That would scare the hell out of me if I knew something huge was so close by. The hump looks interesting but seems flat and motionless to me but there is a slight wake at the head. I'm not writing this off as a hoax but I'm not sold on it either. I would really like to hear from O'Connor himself and ask him all about this sighting. On another sighting here good work contacting Robert Badger and getting his own nessie sighting account! I enjoyed reading about that one. There would have been enough light to see it coming. I would like to speak to him myself, but he is now dead. According to reports that I read (admittedly about 40 years ago! ), O'Connor said he had some military training so that he could wade through water without creating a ripple. Although, as I recall, he was somewhat unkindly described at the time as a "26 year old publicity seeking fireman from Gateshead." O'Connor was apparently answering the call of nature at around 4am when he "noticed the Loch Ness Monster", and said it had strong neck muscles, and eyelids that seemed to be shut. Groyney, you can read my take on the overall events in my three articles on the photo. Google for "peter o connor loch ness" to find them at the top. It's quite amazing isn't it!!! Because the dinosaurs got wiped out... and if the creators under water as a egg or something didn't get hit...That would mean there are loads!!! Even maybe by the ferry we never know... I think I saw a tale in the water before and a huge body and a small head... reply if you need help I am quite an expert about this.